Actors Lee Min-ho, Kim Bum and Ku Hye-sun turned up at a theatre on Wednesday in support of their "Boys Over Flowers" co-star Kim Joon who starred in a musical for the past three months. The three actors made a surprise visit to congratulate Kim Joon on the last day of his musical "Youth March", his agency Planet 905 said in a press release. 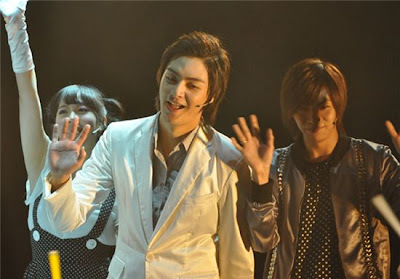 The two F4 members and heroine of the hit TV series watched the two-hour musical and visited Kim backstage afterwards. 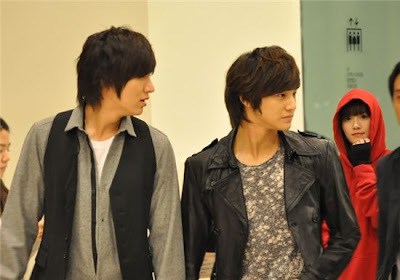 Kim had starred as one of the F4 members, which also included boy band SS501 singer Kim Hyun-joong, in the drama which aired early this year. Kim Joon, originally a member of boy band T-Max, will resume his activities as a singer and visit several countries in Asia on promotion -- flying into Vietnam tomorrow and moving onto Hong Kong, Singapore and Japan.